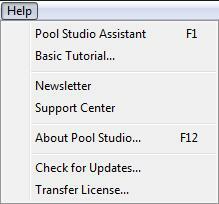 Moving your license of Pool Studio or VizTerra from one computer to another. This option is useful for those who want to use Pool Studio or VizTerra on a machine at work and at home, or simply need to move the software from one machine to another. If connected to the internet, choosing this option will automatically open up your license allowing you to register on a different computer. The previous installation will revert back to demo status. Once you press Yes, your license will be open and ready to be registered on another computer. If you wish to continue using the computer you are currently on, simply register your license again. PLEASE NOTE: If you are transferring your license for use on a laptop computer, make sure you register the key on your laptop while you are connected to the internet. It is not possible to transfer the license in the field without an internet connection. Remind me to transfer my license on exit: Click this checkbox to receive a reminder every time you close Pool Studio or VizTerra. This is useful if you work between an office and home computer everyday.